With some tortellini on hand you can make so many different types of dishes, however sometimes we can stuck in tomato sauce, sausage rut and need something new and different. That's when this combination came into play: we sauteed fresh leeks with garlic and tomatoes, deglazed with dry vermouth and then added crumbled feta right in the pan along with the cooked tortellinis. This way, the feta just melted and integrated into the dish and the result was a very flavorful, slightly creamy dish, that everybody around the table enjoyed. Sautee the leeks in the butter for about five minutes along with some salt. Cook the tortellini in plenty of boiling water. At this point add the tomatoes, garlic and the dry vermouth to the pan and let cook for about 3-4 minutes. Add the cooked, drained tortellini to the pan along with the crumbled feta, lemon juice and balsamic vinegar. Let everything come together in the pan for a few minutes, then add plenty of freshly ground pepper and serve immediately. If you're getting a little tired of having ravioli with tomato sauce, cream sauce or pesto, then it might be time to try something a bit different that will leave you just as satisfied. This dish features store bought ravioli (or by all means, make ravioli yourself if you feel up to it!) along with onion, mushrooms and a sauce with white wine and butter. The result is just as elegant and delicious as it sounds, plus it's pretty quick and easy to make. When it comes to the wine, buy something reasonable – don't go overboard and buy a fancy bottle, just buy something that you would like to drink alongside the meal. In a sautee pan, use two tablespoons of the butter and sautee the mushrooms and the onion for about 10 minutes, or until they are soft and slightly browned. Add the garlic and cook for another couple of minutes. Then add the wine and let simmer slowly for about 5-10 minutes. Meanwhile cook the ravioli in boiling water. When the ravioli is almost done, whisk in the remaining 2 tablespoons of butter in the sauce, taste with salt and pepper and add the cooked ravioli to the pan. Add some fresh, chopped herbs. Serve with some nice Parmesan or Asiago cheese and some additional freshly ground pepper. Sit down, enjoy and finish the bottle of wine alongside the meal. Spaghetti with clam sauce is such a simple dish to make, yet it is so tasty and very fulfilling. Of course it’s nice if you can use fresh clams, however canned work just fine. Some fresh herbs would be a nice addition. Serve with a glass of wine, some crusty bread and some nice Parmesan cheese. Boil the pasta. Sauté the onion in the butter for a few minutes, until translucent. Add the garlic, the basil and the oregano. Add the dry Vermouth, simmer for a minute, then add the clams and the juice of half a lemon. Add salt and pepper to taste. Immediately add the cooked, drained al-dente pasta and stir well. I have made this dish many times and I have found that this method works the best. During my attempts at this dish I have at times achieved a result more reminiscent to scrambled eggs than a heavenly cream mixture. That happens if you pour in a cold egg mixture onto a hot pan with pasta. Don’t do that! Instead, heat the cream mixture up, temper the eggs and mix the pasta, cream mixture and bacon OFF the heat. Also for optimal result, try to cook the bacon very evenly and crispy, and don’t be afraid of seasoning this dish generously with black pepper. After all, Pasta Carbonara got it’s name from carbone which means coal in Italian, due to the high pepper content I assume? Put a big pot of water on a boil. Sauté the bacon on medium–low heat to achieve even, crispy bacon. Remove all the bacon fat and dry the bacon on a plate with paper towels. Place the pasta in the water. Heat the milk and the cream up. Whisk together the egg yolks and temper the eggs by slowly adding the hot cream and milk mixture. When the pasta is cooked, drain and mix the pasta with the bacon and pour the warm egg and cream mixture over. Mix well, add some salt and apply a generous amount of freshly ground black pepper. Serve with Parmesan or Pecorino Romano cheese on the side and extra pepper. This classic Italian meat, tomato and spaghetti dish is perfect to serve either as an every-day meal or on a more festive occasion. It pleases a crowd as well as an intimate party and is accepted by even the pickiest eater. We prefer to buy a larger cut of meat and cut it into very fine pieces in the food processor. That way you will know the quality of your meat for sure and there will be no chance of contamination by grinding machines and multiple steps. This is also a perfect sauce to freeze – make an extra batch and keep in the freezer, that way there’s always something tasty and homemade to eat. This sauce is quite delicious: lots of onion, garlic and tomato as well as plenty of meat. Wine, Worcester sauce, cream and balsamic vinegar adds flavor and complexity. A little flour is added in the sautéing process to ensure a thicker and creamier saucer and bullion cubes provides a nice alternative to salt and adds a better overall taste. Serve with some al-dente spaghetti, some freshly ground pepper, a sharp aged cheese (such as Parmesan or Pecorino Romano) and a nice glass of red wine. Sauté the onion in the butter. After a few minutes add the ground beef and cook until brown and cooked through. Add the oregano, basil, onion powder and onion salt. Add the tomato paste, the Worcester sauce and the flour. Cook for a few minutes, then add the wine and cook for a while longer. 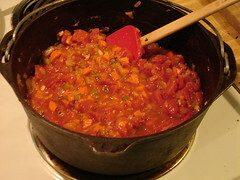 Add the diced tomatoes, the water, the bullion cubes and the sugar and bring to a simmer. Cook for about 15 minutes or until nice and incorporated. At this point, add the cream, the balsamic vinegar and add salt and pepper to taste. If you have some leftover cooked meat from yesterday, then using it in a creamy pasta is a great way of making it go further, and getting a delicious meal in the process. Here we have used some leftover New York strip steak that was cooked medium rare. 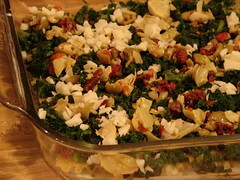 It is sliced thinly and combined in a pasta dish with broccoli, swiss chard and a sauce with blue cheese and sour cream. It's quick, simple and utterly delicious. Heat the water up for the pasta. Cut the broccoli in pieces and chop up the swiss chard. Slice the meat very thinly. Cook the pasta. In a pot, melt the butter and saute the garlic for a minute. Add the broccoli, the swiss chard, the blue cheese and the sour cream. Once the sauce has come together, add the meat and let come to a simmer. Taste with salt and pepper. Drain the pasta when it's ready and add that to the pot with the sauce. Serve immediately. Tasty one dish comfort food, add a salad and you have a rainy day meal. Cook elbow macaroni and drain, adding butter and toss. Add bread crumbs and all ingredients and mix well. Pour in a greased 2 quart casserole dish and top with paprika. 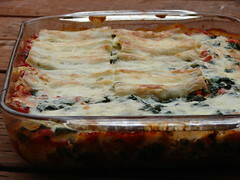 This is one of my favorite lasagna recipes. It has been a staple in my family for many years and everybody always loves it. 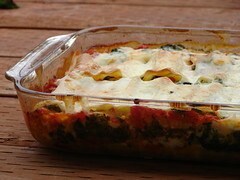 The combination of a tasty, hearty tomato sauce and spinach coupled with nutmeg and cheese is absolutely delicious. This is the kind of recipe that the true carnivore might first sneeze at, but once you serve them a piece they will love it! Spinach and tomato sauce might not look like the most luxurious combination, but it’s something about this lasagna that makes all the pieces come together. Serve it with a nice glass of wine and a light salad on the side, either on a week night or on a festive occasion. Start sautéing the onion in the butter. 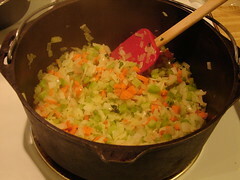 After a few minutes add the carrots and the celery plus a pinch of salt. Sautee the vegetables for about 10-15 minutes until they start release their liquids. Now, add the chopped garlic and the tomato paste as well as the herbs. Cook for a minute or two and then add the crushed tomatoes and the bullion cube. Let simmer for about 30 minutes. Season to taste and apply a generous amount of pepper. Make sure the spinach is well thawed, season it with the nutmeg. in the flour and cook for a minute or two to remove any “flour” taste. 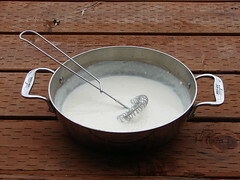 Once you have a nice, light roux, start adding a cup of milk at the time, whisking as you go. 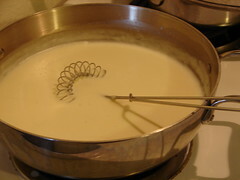 Once all the milk is incorporated, continue to whisk and let the sauce come up to a simmer. If your sauce is too thick, you can always add some more milk. Season with salt and nutmeg.
. Start with layering it with béchamel sauce. Next add a layer of lasagna. On top of the pasta layer tomato sauce, cheese and spinach. 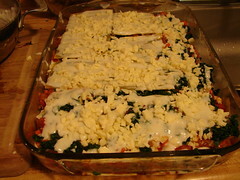 Add another layer of pasta and do it over again (tomato sauce, cheese and spinach). Top with the last layer of pasta and finish off with béchamel sauce and cheese. Bake in a 375 degree oven for about 40 minutes until nice and golden. Preferably let rest for about 30 minutes before cutting into. Or let it cool, place in the fridge and heat it up for later (it’s better the next day). This is a nice creamy dish that really brings out the unique ricotta texture. Here comes a twist on our favorite vegetarian lasagna. 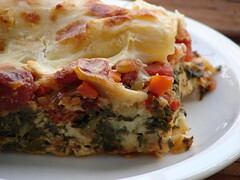 Mediterranean Greek Lasagna! We love the traditional Greek ingredients such as Feta cheese, sun dried tomatoes, olives and artichokes, and why not add those to a lasagna? Coupled with spinach, tomato sauce, and cheese, that would be delicious! 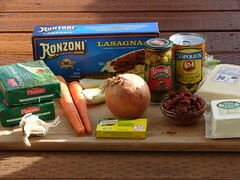 So we started off with our vegetarian lasagna, and added a few extra ingredients. We made a Mediterranean mix with artichoke hearts, sun dried tomatoes, and olives (we used regular green ones because they are so flavorful, but if you have some nice black olives such as kalamata olives on hand, then go ahead and use them). We added this layer to our lasagna as well as some feta cheese. This time we went for regular dry noodles and we didn't pre-cook them. Instead, we made sure the lasagna contained a lot of liquid (moist tomato sauce and plenty of bechamel sauce). You might as well do it this way, since it's so much easier and you won't really know the difference anyway. Start sautéing the onion in the butter. 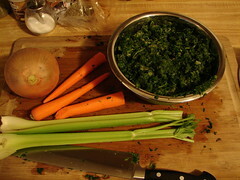 After a few minutes add the carrots and the celery plus a pinch of salt. Sautee the vegetables for about 10-15 minutes until they start release their liquids. 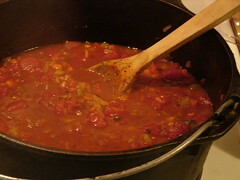 Now, add the chopped garlic and the tomato paste as well as the herbs. Cook for a minute or two and then add the crushed tomatoes and the bullion cube. Let simmer for about 30 minutes. Season to taste, add the balsamic vinegar and apply a generous amount of pepper. Sometimes a tablespoon or two of sugar is also suitable. 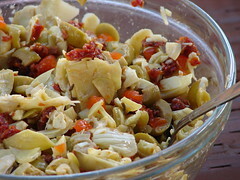 Mix the artichokes, the olives, and the sun dried tomatoes together in a bowl. .. Start with layering it with béchamel sauce. Next add a layer of lasagna noodles. 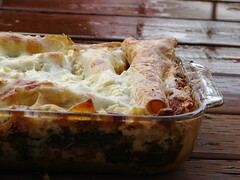 On top of the pasta layer béchamel sauce, spinach, the Mediterranean mix, Feta Cheese, Monterey Jack and tomato sauce. 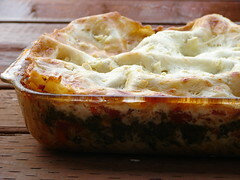 Add another layer of pasta and do it over again (béchamel, spinach, Mediterranean mix, Feta, Monterey jack, tomato sauce). Top with the last layer of pasta and finish off with a generous amount of béchamel sauce and cheese. Orzo salad with spinach, lemon & tomato.